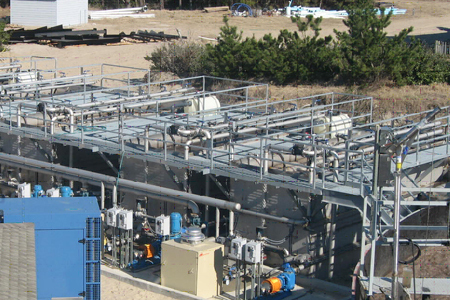 In recent years, the robust growth of residential and commercial development in the Outer Banks of North Carolina has put a strain on many of the wastewater services in the area. The Monteray Shores WWTP in Corolla, at the northern end of the Outer Banks, was no exception. The existing treatment facility, though well operated and maintained, was limited to a maximum hydraulic capacity of 180,000 gpd and was originally configured only for BOD, TSS and NH3 removal. Additional capacity and improved capabilities would be required or development would be forced to come to a halt. The WWTP is further challenged by substantial swings in influent flows which fluctuate heavily depending on the season in this tourist destination. Combined with the hydraulic and treatment performance limitations of the original plant, this created a unique set of challenges requiring a significant overhaul of the facility.